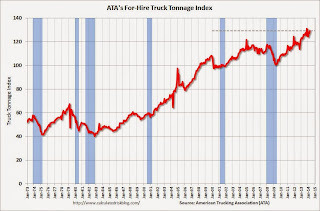 The American Trucking Associations’ advanced seasonally adjusted For-Hire Truck Tonnage Index increased 1.5% in April, after rising 0.6% the previous month. In April, the index equaled 129.1 (2000=100) versus 127.2 in March. The all-time high was in November 2013 (131.0). Compared with April 2013, the SA index increased 4.8%, which is the largest year-over-year gain of 2014. “April was the third straight gain in tonnage totaling 4%,” said ATA Chief Economist Bob Costello. Tonnage is off 1.4% from the all-time high in November. The index has rebounded following the sharp decline during the winter and is now up 4.8% year-over-year.